Was born in Moscow, June 30, 1960. He is Doctor of Physics and Mathematics, Professor of Physics Department at Bauman Moscow State Technical University, a well-known expert in the field of laser diagnostics of colloid systems. Nikolay Fedorovich attended the lectures of such outstanding scientists as AA. Logunov, I.E. Dzyaloshinskiy, I.A. Shishmarev, I.M. Ternov, S.A. Ahmanov, O.V. Rudenko, A.P. Sukhorukov, L.V. Keldysh, D.N. Klyshko, R.L. Stratonovich, Yu.L. Klimontovich. He took part in a scientific seminar on nonlinear optics under the guidance of Professor S.A. Akhmanov at the Department of General Physics and Wave Processes of Physics Faculty at Lomonosov Moscow State University. In 1988 he passed Ph.D. defense and in 1998 he defended his doctoral thesis on "Laser stimulation and sounding of phase transformations in stratifying solutions and homogeneous transparent liquids." Nikolay Fedorovich undertook internships at the University of California, in Berkeley, USA, in 1994, and at the Australian National University, in Canberra, Australia, in 1995. He worked at European Laboratory for Nonlinear Spectroscopy (Laboratory European Nonlinear Spectroscopy, LENS) in Florence, Italy, in 1990. He collaborated with famous scientists: Professor Barry Ninham (Australian National University, Canberra), Professor Richard Saykally (University of Berkeley, California), Professor Salvatore Califano (European Laboratory for Nonlinear Spectroscopy, Florence). Since 2000 Nikolay Fedorovich Bunkin has been the Professor at Physics Department, Bauman Moscow State Technical University. His scientific work focuses on experimental and theoretical investigation of the interaction of laser radiation with liquid media, and more specifically he is interested in optical breakdown of transparent liquids, dynamic light scattering and polarization scatterometry in colloid systems and phase microscopy of nanoparticles in liquid media. N.F. Bunkin put forward an original method for laser investigation of phase transitions in stratifying solutions, which made it possible to observe light-induced transitions in a metastable and labile regions. Nikolay Fedorovich was the first to have shown experimentally that in a very dilute aqueous solutions of completely soluble polar organic liquids, in a certain range of solution concentrations there spontaneously appears a suspension of nanosized droplets, which consist of pure (with a concentration of 100 mol%) polar organic liquid. The effect was interpreted in terms of specific spinodal decomposition in a system with a dichotomic hydrogen bond between the molecules of the solute and the solvent. Thus, the concept of an infinitely dilute solution of polar organic matter in water was substantially refined. N.F. Bunkin developed new conceptual views of water and aqueous solutions of electrolytes, according to which liquids which are in thermodynamic equilibrium with the gaseous medium and contain the ionic component are a dispersed system of "pure liquid + nanobubbles stabilized by ions." In the literature, such nanobubbles are called bubbstones (abbreviation from bubble stabilized by ions). In the experiment on dynamic light scattering, the bulk density of nanobubbles was first measured depending on the ion content and temperature. The research showed that such nanobubbles serve as centers for optical breakdown and acoustic cavitation, as well as nuclei of effervescence. In addition, such nanobubbles are present in biologicalsystems; their presence in blood is one of the causes of caisson disease. N.F. Bunkin proposed a method for helium washing of water samples and aqueous solutions of electrolytes, which makes it possible to completely remove the molecules of dissolved gas from the system. He developed a technique for nondestructive diagnostics of polymeric membranes swelling in water and aqueous solutions based on photoluminescence with a sliding fall of pump radiation. Moreover, he experimentally studied dynamics of swelling of proton-exchange polymer membranes by the example of Nafion. The density distribution of polymer particles in water with different deuterium content was obtained theoretically. N.F. Bunkin is a member of two specialized councils for defending doctoral dissertations. In 1999, he was awarded the Presidential Grant for young scientists - doctors of science, and in 2000 - 2001 he received a personal grant from the Foundation for the Support of National Science. He is the author of 69 articles, (Hirsch index - 14, Web of Science), co-author of the textbook "Stochastic Systems in Physics and Engineering" (2011, BMSTU Publishing House). Nikolay Fedorovich is the co-director (jointly with S.D. Zakharov) of a scientific seminar on physical, chemical and biological properties of water (P.N. 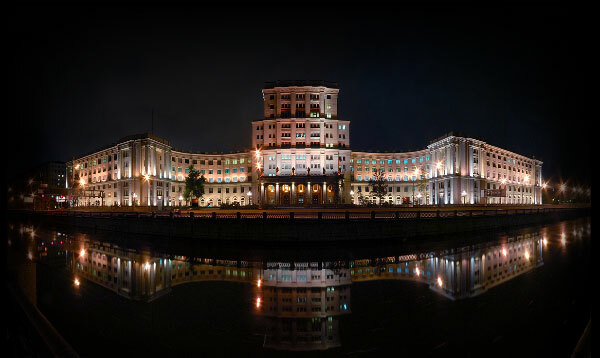 Lebedev Physical Institute of the Russian Academy of Sciences, Moscow). He participated in the organization of All-Russian Conference "Raman scattering - 85 years of research", Krasnoyarsk, Russia, 2013. He spoke at scientific seminars at the universities of Canberra, Melbourne, Sydney, Boston, Seattle, Norwich, Paris, Rome, Florence, Nagoya, Utrecht, Groningen, Dresden, Berlin, London, Lund. He is an expert of the Russian Science Foundation and the Russian Foundation for Basic Research, a member of the editorial board of the journal "Proceedings of Prokhorov General Physics Institute, Russian Academy of Sciences".